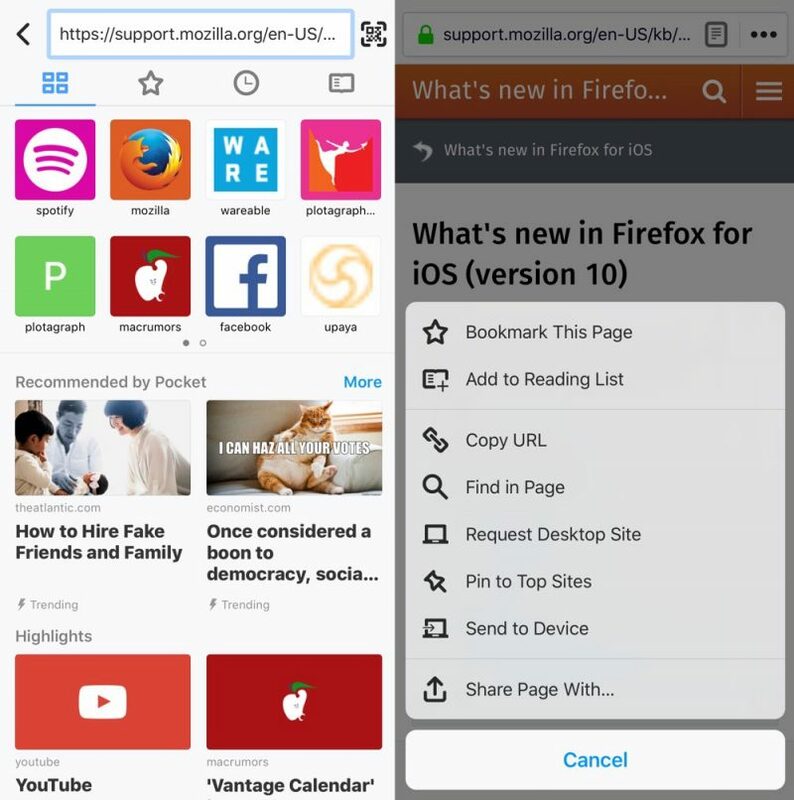 Mozilla released version 10 of its Firefox browser for iOS on Wednesday. With a new look the developers have dubbed "Photon", the update represents the Quantum release for mobile, boasting the same performance advantages as its forthcoming equivalent for desktops. The more modern design aims to put users' needs first, with rearranged menus for easier access to the most-used features and an updated minimalist look. A new application menu now sits at the bottom of the interface, providing quick links to top sites, bookmarks, reading list, history, Settings, and one-click options to enable Night Mode and hide images. Elsewhere, a Page actions menu can be found in the address bar, containing frequently used actions like share, sync, or save content for later, as well as page search, pin site, and bookmark options. In addition, the new tab screen has been overhauled, with icons that link to top sites from around the web and popular articles on Pocket, as well as pages you've recently visited or bookmarked. Firefox will now show popular search suggestions by default as you type, while the QR code reader button has been moved up next to the address bar to make it easier to find. Also included in this release is Firefox's "Tracking Protection" privacy technology, which the company developed to mitigate invasive tracking of online activity. Firefox 10 on iOS is a free download for iPhone and iPad available on the App Store. [Direct Link] The desktop version of Firefox Quantum is set for release on November 14. Is Firefox still a thing? I've long transitioned over to Google on my Mac, and use Safari on my iPhone. So had I. But then I transitioned back to having some free RAM. With a new look the developers have dubbed "Photon", the update represents the Quantum release for mobile, boasting the same performance advantages as its forthcoming equivalent for desktops ('https://www.macrumors.com/2017/09/26/firefox-new-quantum-browser/'). Firefox for iOS is a wrapper around Webkit (just like every other browser on iOS), so there could not possibly be any of the Quantum performance benefits in includes in this. You need the Gecko engine for that. I've stayed away from anything Google because I just figured they'd find a way to track everything we do. I'm probably wrong about that, aren't I? Nope. They use their own engine named "gecko", which is what came after the original Navigator engine. The new engine, "Servo," is totally new though and written entirely in Rust. I'm not a FF fanboy by any means but I'm excited to see what they've accomplished. It all depends on how much information you want to funnel into Google. Some people don't. They go with other vendors such as Apple and Mozilla that have a history, and culture around protecting privacy. Others don't care, and lean toward Google, Chrome, Facebook, and Android.